Deer are overtaking communities along the Wasatch Front and DESTROYING carefully maintained landscapes costing homeowners THOUSANDS of dollars annually. Cities from Ogden to Lindon have considered special permits for bow hunters to ‘thin out’ the growing populations. 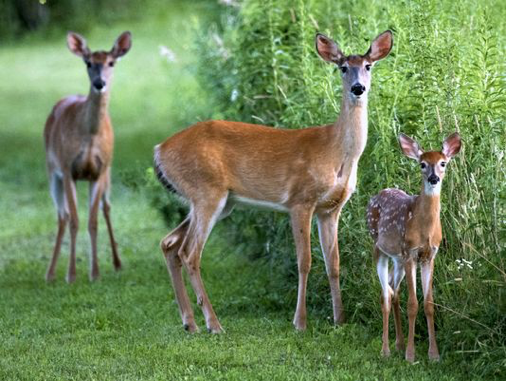 Deer are the#1 cause of residential landscape damage nationally and are considered PESTS. Our deer deterrent yard spray services in Utah can keep your lawn safe. What can you do as a homeowner to limit Deer Damage? Platinum Deer Protection is the FIRST company in Utah to obtain rights to a Commercial Deer Repellent used in the Northeast for 30 years with a phenomenal track record. Learn how to STOP the Deer Damage NOW with our 100% SATISFACTION GUARANTEE* 6 months of protection with one Utah deer repellent application in the Fall! Deer have a keen sense of TASTE and SMELL; TASTE being the ultimate deterrent in the winter months. If it doesn’t taste good, they move on. Our proprietary deer repellent formula in Utah uses THIRAM ( a proven fungicide), a latex bonding agent that adheres the solution to the plant material, making it rain, snow and ice proof, and an anti-dessicant which helps retain moisture in the plant leaf/needle. Along with other active ingredients, this deet deterrent yard spray in Utah provides 6 MONTHS OF PROTECTION! Platinum Deer Protection is a Licensed, Insured and Certified applicator of deer repellent in Utah. Our 20 years of landscape experience enable us to provide a level of knowledge and attention to your landscape others can’t offer. Our technicians use backpack sprayers and carefully apply the product up to 8’ off the ground. The Winter application, applied in the Fall, lasts an amazing 6 months! The product is rain, snow and ice resistant which means once it is applied, it binds to the plant material through extremely effective sticking agents. Will It Kill Dogs, Cats, Deer or Other Wildlife? No! It is not safe for aquatic life. Will It Damage Plants or Trees? Absolutely not! In fact, we often find plant and tree material performs better with the product because of the beneficial ingredients. Does Anyone Else Offer This Type Of Deer Repellent Service In Utah? Not that we are aware of. We have spent many hours researching this problem, trying different solutions, and not found anyone or anything that provided real results until now. Will It Stink Up My Yard? No, there is a slight odor that disappears quickly after the application. How Does The 100% Satisfaction Warrantee Work? If you are not satisfied with the results, we will come at no charge, and re-spray the areas where damage is occurring. We do not warranty plant material. Are Any Special Licenses Required To Apply This Product? Yes, any commercial applicator needs to have a Pesticide Applicators License and the Company needs to be registered with the State of Utah. Accordingly, our company is registered and each technician is licensed. We also carry a Commercial Liability Insurance Policy. What Makes Platinum Deer Protection Qualified To Do This Work? Platinum Deer Protection is a subsidiary of Platinum Landscape & Pools, a high end residential Landscape and Pool Contractor. We have been installing gorgeous landscapes across the state of Utah since 1998. We have an intimate knowledge of the challenges posed by deer, and receive frequent requests to help alleviate deer problems. Now, we have a proven deer repellent product here in Utah we are willing to put our reputation behind. Absolutely! One deer can cause thousands of dollars in damage in one feeding. Certain evergreen species, like Arborvitae, can be eaten bare. It takes years for these trees to grow out, and replacement costs are in the thousands of dollars. The cost to protect your landscape investment is minimal. Only $399.00 (Normally $479.00. now on sale for ONLY $399) for 6 months of protection! Our basic application covers up to 1/2 acre residences. Should more be required, we charge an additional $79.00/gallon. Can’t I Just By This Product At a Garden Center? Absolutely not. Platinum Deer Protection is the first company in Utah to be granted permission to apply this deer deterrent product. It’s only sold to Commercial Applicators. It’s easy. Simply fill out the attached Customer Form. Please include a form of payment for the first application, you will be sent a confirmation e-mail, and someone from our office will personally call you and arrange a time for a technician to visit. Visits are weather dependent and subject to change. Can I Talk To Someone If I Have More Questions? Absolutely. You can reach us by e-mail at deer@platinumlandscape.com or our office at 801-701-0493.